Father Frank Daly, our parish priest, visits the school regularly along with Deacon Robin Pollard. Links are made between the school and church, particularly regarding the preparation for the Sacraments. Mrs Connor, our school chaplain, organises and manages the chaplaincy team on a weekly basis. She also helps with liturgical preparation. "The overall effectiveness of the Catholic life of the school and its provision for community cohesion are outstanding. St. Peter's is a welcoming inclusive school where everyone is valued as a creation of God formed in His own image and likeness. The Mission of the school is a lived reality where God is at the Heart of St. Peter's School." Our Mission Statement is prominently displayed in our Welcome Area. It serves as a constant reminder that ’God is at the heart of our school’. The Mission Statement is displayed in every classroom. The children in each class have made a commitment to actively ‘live’ our Mission Statement throughout our school lives. Each class has a prayer focus table. We display work from our current theme from "Come and See" and provide opportunities to explore Scripture and meaningful prayer in our daily lives. 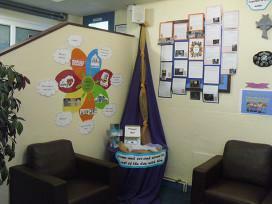 We have a dedicated Prayer Room which the children can use as they wish. 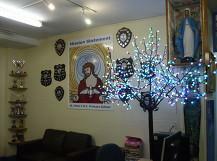 Mrs Connor, our school chaplain, is based in this room where she runs regular prayer groups. She also coordinates our 'student chaplaincy team' who plan and run whole school celebrations. 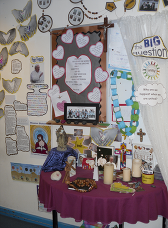 There are religious artefacts in the Prayer Room for the children to take back to their classrooms. The "Come and See" topics are displayed in the Welcome Area. The children can identify that a common theme runs throughout the school. 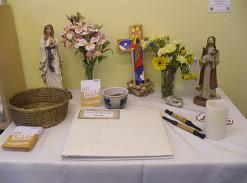 We display photographs of liturgies and celebration, alongside evaluations from those who took part. We celebrate our successes and constantly work towards improving Collective Worship within school. Our amazing P.T.F.A has helped turn our dreams of a prayer garden into a reality. The Prayer Garden was officially opened and blessed in October 2015. Each class designed a stepping stone on a prayer theme, and these were added to the Prayer Garden throughout the opening day. 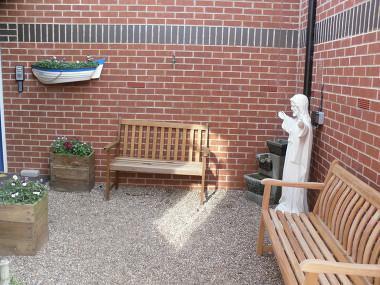 Our Prayer Garden is dedicated to the memory of our wonderful former school secretary, Mrs Saunt, who sadly passed away in 2014. Each Class has contributed to a whole-school prayer for our school. You will see the prayer attached below. There is a copy of the prayer for each class on or by the Class Focus Table. One of the Chaplaincy Team took photos of the beautiful statue of St. Peter that local artist, Carmel Cauchie, sculpted for our school and each class has a photo of the statue on the copy of their class's whole-school prayer. Our Chaplaincy Team is led by our school Chaplain, Mrs. Connor. They work very hard helping to promote and develop the Catholic Life within our school, from launching our new school prayer to outstanding charitable work for may worthwhile causes. Please click on the link below to find out more about the amazing things that they do. Each term we look at 3 different topics as part of the 'Come & See' R.E. programme. We also look at 2 other world faiths during the year as part of the programme (Judaism in the Autumn Term, and another faith in the Summer Term). Each term your child will bring home a 'Come & See' letter outlining the R.E. topics that they are looking at that term, and important liturgical dates during that term. You can also find a digital copy of that letter by clicking on the link below. Each month in Achievement Assembly, the Cup of Kindness is awarded to the child who has shown outstanding kindness. Nominees are suggested by teachers and grown-up's who have spotted them engaging in kind acts which go above and beyond the everyday kindness that is shown around the school. We feel that this is something to be celebrated and, therefore, every month the recipient of the Cup of Kindness will be celebrated here on the website. The 'Come & See' award is a relatively new award within our school. This award was launched to celebrate the outstanding pieces of work that are produced by our children in their RE lessons. At Diocesan meetings the quality of the work of our children has often been commented on, and we felt that we wanted to celebrate this with the children. During Achievement Assembly at the beginning of each month, a recipient of this award is announced. Teacher's nominate outstanding pieces of RE work that they have seen during lessons, and a winner is decided following discussions and looking at the work that has been nominated. Each recipient receives a certificate and a fish pin showing the symbol of Christ. This is an award which we are very proud of, which is why every month we shall be sharing the winner of the award on the website. The winner of the Come & See award for February is Isabella. Isabella won the award for showing her understanding of the bread and wine during the Last Supper.